Do you find your mixes a bit dull and weak – lacking that “something”? 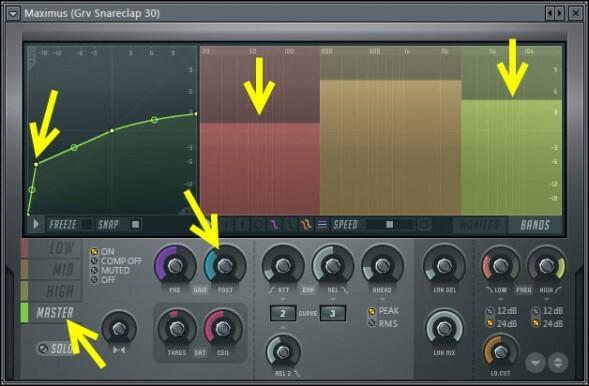 In FL Studio you have tools which you can use to try to quickfix this. One of these tools is Soundgoodizer. Now, despite the fact that many people overlook Soundgoodizer, surprisingly many talented producers and pros DO use it in their music production. Why? Simply because it actually works to an extent and CAN make things sound good quickly and easily. And what’s really cool is that you can find the Soundgoodizer presets inside Maximus (which is actually the sound-engine of Soundgoodizer) and tweak every fine detail of these presets to suit your needs. In this tutorial, I’m not using Soundgoodizer however, but Maximus and one of the Soundgoodizer presets and slight modification to show you how you can quickly add more excitement to your mix. Hear the difference? If you didn’t like the sound of that, it’s ok – not everyone like that kind of hyped, over compressed and pumpy sound. But if you liked it, continue reading. So how did I make it sound like that? The secret is a slightly modified Maximus preset (“Soundgoodizer a” preset). To show this in step-by-step: in the 3xOsc Mixer track effect chain, I first loaded Fruity Reeverb 2 and dialed the Decay to around 7 seconds for a long reverb and Pre-delay to around 115ms. I also lowered the reverb Wet level because the Maximus does boost the signal quite heavily. Now, after the Fruity Reeverb 2, I added Maximus to the effect chain and loaded the preset “Soundgoodizer a”. Basically, this Soundgoodizer preset enhances/boosts low, mid and high frequency areas via compression. Also, a bit of Saturation is applied to the low/high frequencies and to Master as well. And furthermore, Stereo separation is applied to mid frequencies to widen the stereo image a bit. You can control the amount of enhancement of each frequency band by tweaking the Pre-gain knob in their respective sections or by dragging those bars vertically in the Band display mode. You can use Post-gain knob for controlling the amount of enhancement as well. Now, as for the modifications: to push things a bit further, I modified the compression envelope in the Master section so that it amplifies heavily low level input signals. So, I went on and added a new envelope point and dragged it up to -4.7dB. This will boost all the quieter parts of the incoming signal which’ll make things sound “fatter”, but also a bit pumpy as when the input signal peaks reach the compression threshold level, the compression kicks in. I also decreased the Low and High band Pre-gains to lower the bass and high frequency enhancement. I also decreased the Post-gain in the Master section as the output volume was a bit too high in relation to other elements I had going on in my example mix (the drums). The Post-gain in the Master section is the final output level you are going to get from Maximus so use that to lower too high final output level. Now, as the Fruity Reeverb 2 unit was before the Maximus in the effect chain, the compression affected to the reverb as well: it boosted the signal level of the reverb tails and this is what made the example sound huge. Note that the order of effects in the effect chain is important: the reverb must come BEFORE the Maximus if you want to make things sound like in the example. Oh and if you’re wondering what the Parametric EQ 2 is doing there, I just used it as additional volume controller for the 3xOsc (to add more gain). It’s actually not a relevant part of this tutorial or the example sound. To be specific, I processed only the snare sample and a drum loop (from FL Studio Legacy Library) with Maximus to “smash” them with a modified “Soundgoodizer a” preset. For the snare I used quite the same settings as with the 3xOsc sound, and also dropped the Post-gain a bit to control the final output level. And for the drum loop I used pretty much the same settings as with the 3xOsc sound and snare. I also used the Mixer track EQ to roll off the lows from the drum loop. As you can hear, the drum loop sounds like it’s “pressurized”. And when mixed with the drum beat, it gives that special feel to the whole drum mix. You can also apply Soundgoodizer treatment to a group of sounds easily via Mixer track routing. I sometimes use this to “gooderize” (lol) my whole drum mix. However, if you are going to use heavy compression settings, you might want to leave the kick out of the process to protect it’s punchiness. Or use parallel compression instead. Furthermore, I wouldn’t suggest using Soundgoodizer or Soundgoodizer Maximus presets on your whole mix or you probably end up with over compressed, pumpy, mashed pile of audio. But as a special effect on individual sounds or group of sounds, it’s great! Great tutorial! I always see myself as new to the creation of EDM, and I was quite surprised when I already knew this. I use this trick all the time on my drum beats. You can find the melody in the .FLP file. Thanks for checking the tutorial! YYYEESSSSSSSSSSSS Petri………… dis is so timely just a while ago i was wondering and thinking, this “maximus” is so full of nobes and now u come up with a tut showing how to tweak…….alleluyah mmh mmh….I luv this. Wow. I had never messed with Maximus as it’s only a demo on my version of FL. I threw it on the master of a decent track I’ve been working on, as well as some of the individual instruments.. it was like freakin’ magic. Sounded so nice I actually pulled the trigger and bought the full version. NOT a cheap VST either, but I think it really helps if you want a professional sound. Hi, really love your tutorials. But i have a problem and i can’t find a solution 🙁 Pretty much on all the tracks that i have been trying to mix (i’m a beginner at creating music) it always sounds like the instruments are played far away from me, if that makes sense… It sounds like the music is coming from, like, 5 meters away from me. I mix on headphones and i’ve some professional studio headphones on their way. But i can’t understand why my mixes sound like this. 🙁 I use really good presets for my instruments so that’s not the problem. It sounds like you may have some frequency issues with your sounds. Presets are a good starting point but one of the problems is finding presets that truly work well together. Eventually youll want to make your own synth sounds. in the meantime try something like Voxengo Span or a frequency analyzer on your master fx slot to look at the spectrum of frequencies in your music. if it sounds far away i would think there is too many low sounds and not enough high frequency sounds. Where have I heard this melody before? I really want to hear a full version of it. Did you make it from scratch? I heard sample you made. very nice ! l like it ! Check out my sounds! I’m pretty new to this. Maybe a little over a month, but i play guitar so i have music theory background. If you like Trance Chillout Dance etc. Give me support. Would you define some more about mixer signal flow?